Along with a couple of other wells the “Dutch Well” provided water in the summer for the free-ranging livestock on the island of Saltholm. 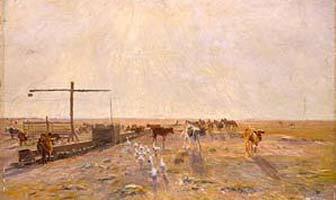 In an attractive, overwhelming backlit picture, Philipsen shows an everyday scene with the animals around the well and a view out towards the horizon. It is typical of Philipsen that his impressionistic method of painting awakens the surface to life, so that the actual paint in a picture like this seems to be alive; if one “only” looks at a reproduction of The Dutch Well, for example, the sunbeams are also almost materialized in the top part of the picture. The oil paint is applied in layers which are thick enough for the traces of the brush hairs and the strokes to be made out on the surface. The surface seems to be in motion, and its restless texture recalls the rough, close-haired look of a cowhide. Philipsen was an animal painter and is known mainly for his many pictures of Danish cattle. A central aspect of his oeuvre is a distinctive impressionistic painting style inspired by among other things his friendship with the French artist Paul Gauguin. Philipsen learned to build up his pictures with series of small parallel strokes, which together reproduced the atmospheric effects of light which were an important part of the Impressionist project. Philipsen concentrated on depictions of his “local area” on the island of Saltholm and at Kastrup, where he lived.